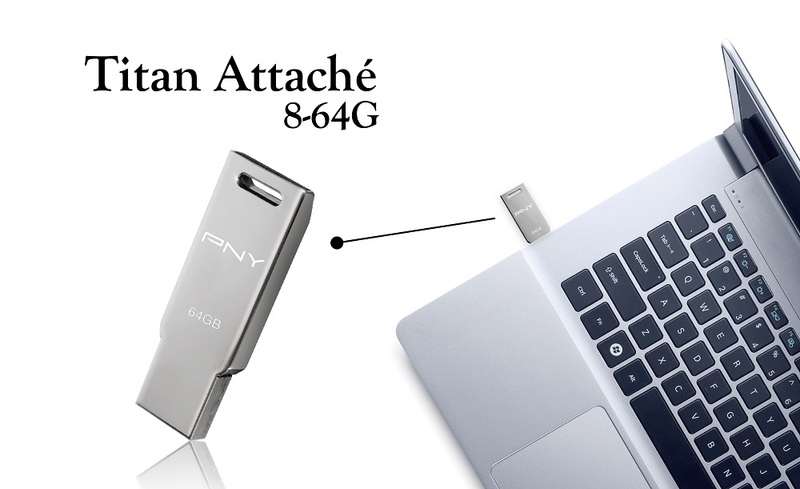 PNY Technologies (PNY) considered one of the worldwide leaders in consumer electronics market and flash memory products, has released the perfect storage device for users who are looking for flash drive with an elegant and long lasting design, the Titan Attaché USB Drive. With high-quality metal outer casing and a slim, streamlined outline, this pocket-sized flash drive gives you the storage, performance and power you need to store, back-up, transfer or share your favorite pictures, videos or music and to secure your private data. It is ideal for students of all ages, traveling professionals and everyone who has a need to share a file or a photo with friends and colleagues. The Titan Attaché Flash drive is lidless and durable design with integrated strap-hole for portable and easy operation. It weighs only 6.1g and measures at H 5 mm x W 14.8mm x L 43mm, despite its small size, it has a metal sleek finish that protects it against scratches to ensure the drive retain its shiny and sleek appearance. The Titan Attaché has a universal USB 2.0 connector, which makes it compatible with all USB ports. The Titan Attaché flash drive reads data at a minimum speed of 22 Mb/s and will write data at 11 Mb/s, and available in 8GB, 16GB, 32GB and 64GB variants of memory space depending on your storage needs. Moreover, it is compatible with Windows Vista, Windows 7, 8, 10 and Mac OS X : 10.X and above, backed with PNY’s limited warranty of 5 years.